Varsity 2016 was certainly a day we will never forget, as Bangor battled it out at home against Welsh rivals Aberystwyth in numerous sport to take home the coveted Varsity cup. The day was full of all types of sports, both familiar and perhaps unfamiliar to spectators, so there was definitely something for everyone to get involved with and watch. Sports played on the day included badminton, where both of the Bangor men’s teams won 8-0. The badminton women however lost 3-5 despite putting up a decent fight in a very close encounter. Basketball followed, in which the Bangor men were victorious, as they didn’t give the opponents a chance winning with triple figures 113-51. The women also played phenomenally as they stormed to victory with a 76-26 win. The men’s lacrosse was one of the standout scores of this year’s Varsity competition. From the very first whistle Bangor were in total control as they were scoring left, right and centre. Bangor didn’t give their opposition a chance. By the time Aber finally scored Bangor were already in double figures. Bangor was more dominant in all of the halves of the match apart from the final half in which Aber did manage to claw back a few goals but it was too late as Bangor were well in front by 21-4. The women’s lacrosse however weren’t as lucky. Though arguably, it was a more entertaining and close game with Bangor losing 7-8. Throughout the afternoon even more sports were played for the audience’s pleasure. These included Fencing which both the women won by 155-128 and the men won though only just 135-121. 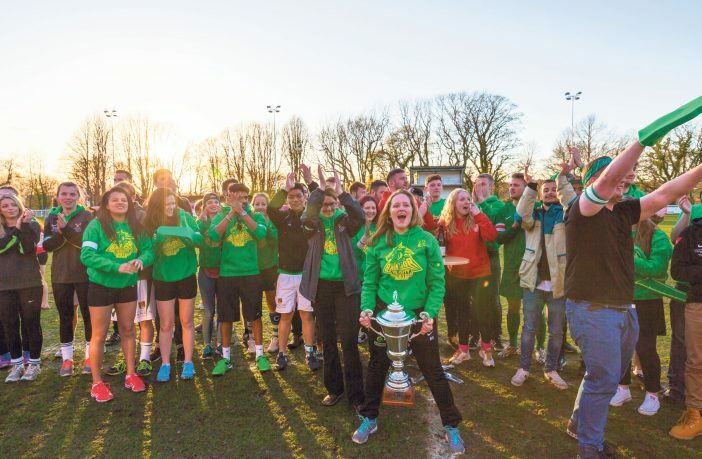 Bangor also won at tennis in the men’s and women’s, squash, netball 2nds, sailing, athletics, triathlon and indoor rowing. Some of the sports in which Bangor was less successful than Aberystwyth included octopush, rugby union men, dance, cheerleading, canoeing and archery. American football, like lacrosse, was another impressive performance both in attack and defence from Bangor where they won 20-0. Another striking performance came from the women’s rugby union team who also stopped their opposition from scoring as they won 32-0. Football was another sport dominated by Bangor, as the women won by a terrific five goals to nil, with all of the goals coming in quick succession of one another, providing much excitement for the fans. Varsity ended in the Bangor City FC stadium where many gathered to watch the men’s football firsts. There was an early scare when Aber scored after a deflection but their celebrations were short lived as it was ruled out as offside. Bangor’s first goal came after a smart low pass was driven into the box to the feet of the attacker who hit the ball over the goalie in style, leaving him helpless. Bangor were given a brief scare when Aber hit the post but they successfully cleared the ball to safety. Before half time Bangor put themselves 2-0 in front with a calmly slotted shot into an open net after the previous shot was saved. Near the end of the match Aber got a goal back from a header, making the score tighter, and straight from kick-off they won the ball back and nearly equalised but Bangor held their own throughout the rest of the match to win 2-1. Overall it was an exciting Varsity, which was helped by Bangor winning by a considerable amount of points. Hopefully next year’s Varsity will be just as exhilarating when we travel to Aber and hope to become the first away team to win Varsity.